In my late twenties or so, I knew that I had to get serious, to stake my claim, as it were, to a foothold in literature, or what I later claimed my "poetic office." Romance had failed me—twice—but the Muse began to woo me. What I mean was, I discovered meter. 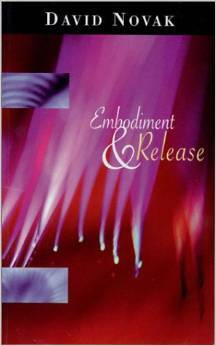 Embodiment & Release contains my earliest poems. Staking a claim meant putting a book together, and so I began to cull everything I had written—and was nigh aghast at how little I had to show for myself. I reached as far back as I could, to the sonnet which opens the book ("While she is watching me her ice eyes taunt"), which was something like my eighth poem ever and my first (faulty) try at a strict form. The early poems in the book—or more correctly, at least the first two-thirds I'm sure—reflect a time before I was secure in my iambs, and if a line hit the perfect pentameter, it was purely by accident. "The Pearl" was originally presented at a workshop. Paul Carroll approved the poem, but disliked the word "enraptured" and suggested I change it. (It goes without saying, that all of the poems of that earlier period were written without punctuation, titles, or capitalization, in emulation of E.E. Cummings, but by the time I took to assembling my book I had already begun to ease into my mature style, and made alterations accordingly.) The subject of "The Pearl" was clearly derivative (in my mind) of the great Middle English poem "Pearl."